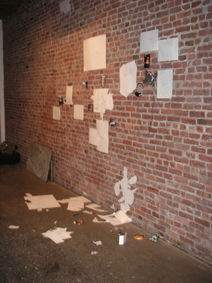 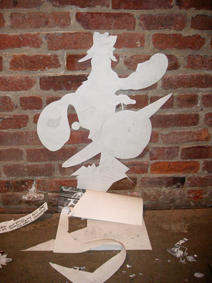 By the inner eastern wall the cut-out drawing of the planet Saturn and some angels playing instruments was taken up off of the floor and placed on the wall right above the cut-out drawing of five figures and the photograph of an anarchy sign. 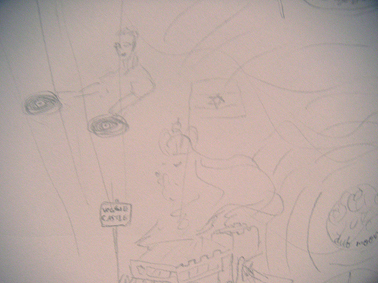 A drawing of a "Veggie Castle" restaurant with a crowned lion bearing a flag and a figure DJ:ing above it was placed underneath the cut-out drawing of a rehearsal space. 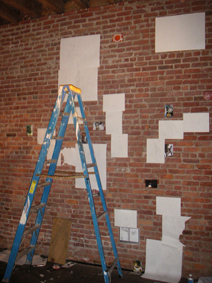 On the outer eastern wall two drawings were hung above the drawing of some figures (including a band) in a cafe. 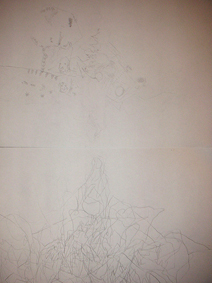 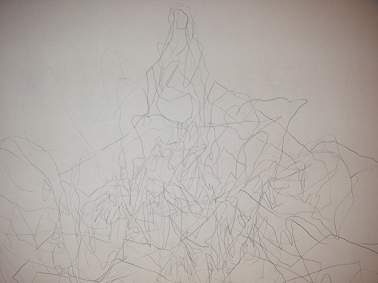 One of the drawings was characterised by an abstract-looking tangle of lines. 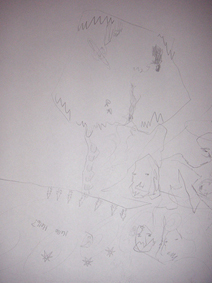 The other one, placed right above it, had a woman, a bunch of heads and a vaguely drawn landscape, including an underground cavern, upon it.